At the top of the farmyard is Stable Cottage. As the name suggests, it used to be a stable and in recent years housed a fine stallion called Blue Beard. Watch sheep grazing and in springtime, lambs frolicking from your window. Henry vacuum cleaner and a full range of cleaning materials. TV/video and a radio/cassette player. ...Very sad to be leaving after just one week. We'll all miss that gorgeous view towards the sea, from the cottage door. "Our first visit here from Sheffield and we feel we have discovered a real gem! Kids enjoyed feeding horses, sheep and lambs and stroking the gentlest sheepdog. Good base for trying out cycle paths and we've enjoyed lots of cliff walks and trips to Scarborough, Whitby and Runswick Bay. We dearly hope to return sometime". 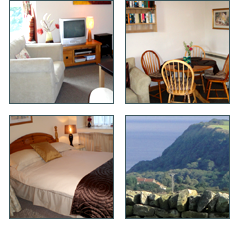 For anyone thinking of taking a break in the serene countryside by the coast in North Yorkshire, our cottages are ideal.